A business portfolio website for a landscape artist in Portsmouth, NH. A local artist need a website to show their portfolio of oil paintings (landscapes and seascapes), and a way to list gallery events. A hub for social media connections was also needed. The artist needed to be able to update their own site. 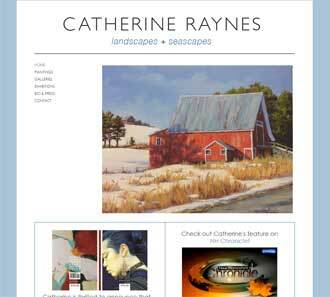 The artist, Catherine Raynes, had graphic design skills, Photoshop skills, and wanted a particular look for the site. A layered Photoshop PSD file, the lingua franca of graphic designers and web developers, containing example pages of the proposed site was delivered. This file was used as a model to build the necessary HTML/CSS/PHP/MySQL in a custom WordPress Theme over the span of a few weeks. This theme was installed on a self-hosted version of the open-source WordPress Content Management System (CMS). After some brief training, the artist was able to upload all of their artwork images into the gallery, add events, and add content to all static pages. A clean, efficient site displaying the artist’s gallery of paintings, and upcoming events. Links to the various social media sites used by the artist are displayed in the footer, as well as a form to sign up for the artist’s email mailing list. "I needed to revamp my website and wanted to be able to make changes independently. A colleague recommended Andy and I couldn't have been more pleased. Andy is very knowledgeable and extremely easy to work with. Once he got the site up and running he was instrumental in taking me through how to update on my own. He has been there for any follow up questions as well. I would highly recommend Andy as your web development partner."